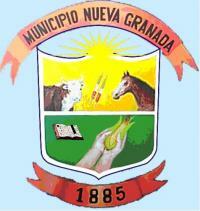 Nueva Granada is a municipality in Magdalena department. It was founded on 4 June 1996. The flag of Nueva Granada is horizontally divided red-white-green. The white stripe is charged with a row of eight gold stars. Same Flag is also reported for Pijiño del Carmen, so it could be a mistake. Obviously a mistake as the image at municipal web site was replaced by horizontal green-white-yellow flag. A new image created with 2:3 ratio to match the official website (new loaction with corrected info), standard shade of green, stray black pixels removed, and exactly equal stripes. The green-white-yellow of the flag comes for the use of these same colors (though inverted) in the local coat of arms.